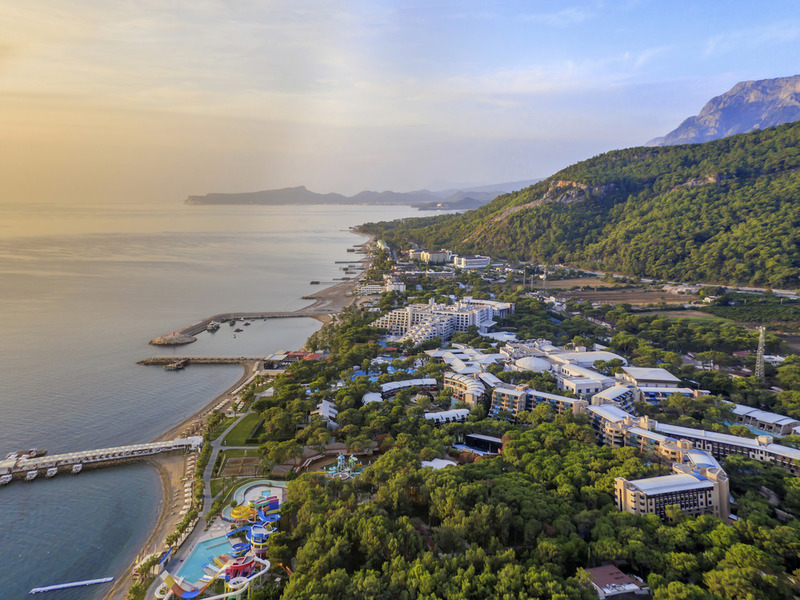 Set in a 250.000 m2 resort with a 1 km private beach, an extensive spa centre and an outdoor pool with an aqua park, Rixos Sungate Resort is in the Gulf of Antalya coast. The extensive leisure facilities at the Rixos Sungate include a gym, tennis courts and a 4-lane bowling alley. The guests at Rixos Sungate enjoy a delicious open buffet during brunch or dinner in the Veranda Restaurant. You have the freedom of choice at the spacious Veranda restaurant that has a capacity to host 550 guests. Every single detail has been considered with a focus on children... Children will have fun and parents will have a break from parenting at Rixy Kingdom. The Rixy Kingdom Yummy Restaurant takes children's culinary taste seriously. Open buffet selections from the world cuisine, diet food and kids' buffet are served all together at the Turkuaz Restaurant. Serving excellent tastes from world and from the local cuisine on theme nights accompanied by the appropriate ambience. Very special tastes from the French cuisine... Serving à la carte, the Supreme Restaurant is in the VIP Area and only available to the guests staying in the villas and special rooms. Dinners are the gourmet's festival at the Supreme Restaurant. Bordering the sea, the Alara Snack is the master of titbits and delicacies, including baked potato, pita, döner, spaghetti or French fries. A delicious stop to chill out in the evening. The Cactus Restaurant serves hot and spicy dishes from the Mexican cuisine as well as delicious fajitas in a stunning backdrop with a spectacular seascape. The restaurant has a seating capacity of 90. The chefs from the Far East, original flavours, a calm environment and simple elegance.... The Far Eastern cuisine is calling you. Serving à la carte, the restaurant has a seating capacity of 40. Reservation is necessary. Tastes of the blue Mediterranean... Magnificent pizzas, pastas.... The smell of thyme carried from the mountain tops. A sweet breeze accompanied by live music in the background... Serving à la carte, the restaurant has a seating capacity of 80. Two neighbouring countries on both coasts of the sea and the unique interpretations of two similar cuisines. The Aegean Restaurant offers specialities and appetizers from the Turkish and Greek cuisines with unforgettable tastes and an elegant atmosphere. Interesting specialities and sushi from the Japanese cuisine... Prepared by competent master chefs, sushi is the most creative delicacy of the Japanese cuisine and an indispensible flavour of oriental dinners. The restaurant has a seating capacity of 40. Under the blazing sun, take a cool break... The Pool Bar is the first destination for day-long refreshments and healthy drinks. Let the entertainment begin with world-renowned DJs, performers and shows.... A wide selection of beverages accompanied by dancing and adrenaline are awaiting you at the Alara Show Centre. A stone's throw away from the reception of Port Queen, the Piano Bar is the meeting point at Rixos Sungate... Also hosts guide meetings. A colourful fairy tale for children... A rainbow of choices is awaiting our little guests on the kiddie beach... Special fruit cocktails, fruit juices, ice lash and soft drinks... Your kids will love them. The first destination to rehydrate and give yourself a vitamin boost after a drenching workout at the fitness centre: Fresh fruit juices and soft drinks are ready to be served at the C Bar. Children deserve the best of everything... Fruit juices, fruit cocktails and ice-creams... Endless choices are available to our little guests in the Rixy Club. For a sweet smile Ice-cream, pies, cakes, milk puddings, all delicious like home-made! Turkish desserts, international recipes, tea and coffee sorts are here for your enjoyment.